We will use a flask boilerplate I created for getting a Flask Webapp working really fast. After cloning the application create a new virtual environment, install all dependencies and make a testrun. We want to create a container that includes the whole web application. The WSGI application shall be served by a gunicorn application server. 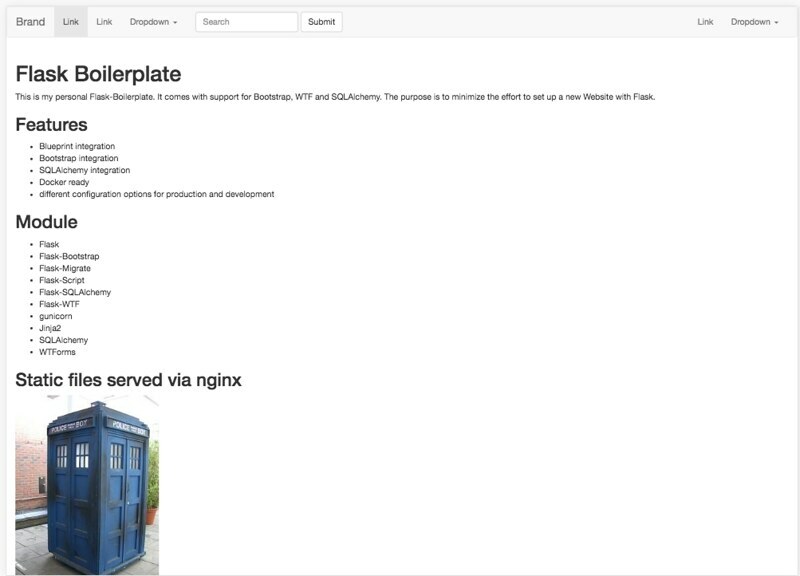 To relief the WSGI server from serving static files (like the Tardis on the index page) we want to put a nginx proxy server in our container as well. So we create a new file called Dockerfile. The syntax of a Dockerfile can be found at the official Dockerfile Reference. What we actually do here is using the latest debian container as a platform. We install python3, pip and nginx and copy the content of our web-app to the /app directory. Also we copy a file called webapp.conf to the nginx config directory. We will deal with this file later. In the line next-to-last we install all necessary Python packages listed in our requirements file and finally the last line runs our small startup script. This file tells our nginx server what to do with the incoming requests. We still need to create it. This actually tells nginx to pass all requests from port 80 to our WSGI application server which listens on port 5000. The only exception are static files which we will serve directly from /app/app/static/. Actually it is not easily possible to run multiple commands on container-startup. So we need to write a small script that starts our nginx server and the gunicorn WSGI server. Now we can build our container and run it. $ docker build flasktest . So if you open up http://localhost:8080 in your browser you should see the Tardis again.